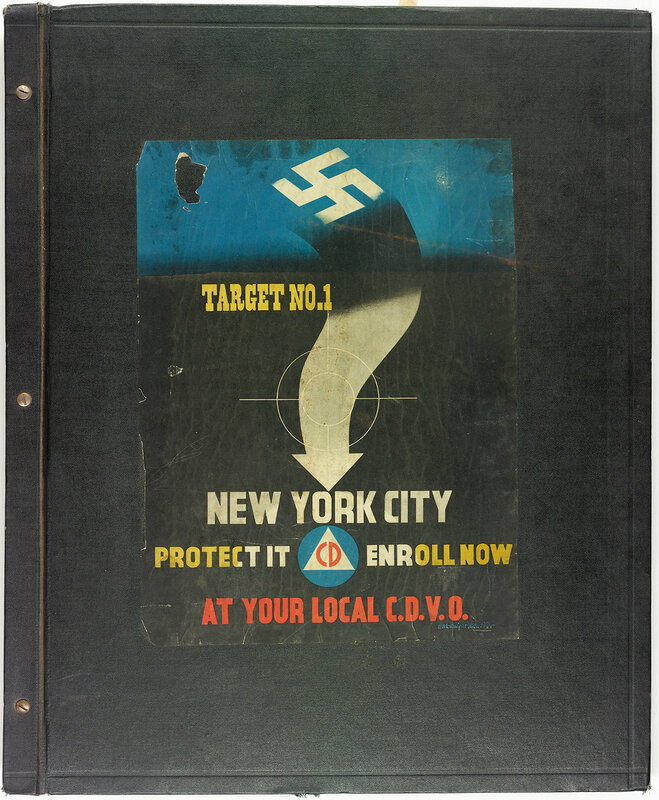 Cover of the Office of Civil Defense Scrapbook from Mayor La Guardia’s papers. This poster and slogan were used throughout the war and emphasized the fear felt by many New Yorkers. On June 2nd, 1943 the Civilian Defense Volunteer Office kicked off a ten-day recruitment drive with a parade and rally at City Hall Park. The CDVO was a new agency created under the auspices of the Office of Civilian Defense to oversee volunteer recruitment and organization in New York City. Both Mayor La Guardia, who also served as the federally appointed director of the Office of Civilian Defense, and Governor Al Smith attended and gave rousing, excoriating speeches on winning the war and defending the home front. “In a spectacular ceremony at City Hall,” the New York Times reported, “the Mayor called both ‘yellow’ and ‘lazy’ every man in the city who ‘has taken advantage of his family to avoid military service and yet refuses to serve in the protective services.’” Ticker tape fell on the parade, which was meant to remind New Yorkers of the threat of bombings. Underlying the atmosphere of celebration ran a current of fear. From September 1940 to May 1941, Americans watched and listened to the reports from besieged London. The attack on Pearl Harbor on December 7, 1941, brought the war to the United States’ doorstep. By the time of the attack, Mayor La Guardia already had been the director of the national Office of Civilian Defense (OCD) for eight months, which the bombastic mayor took as evidence of his prescience. His strategy, as head of the OCD, was to stress, relentlessly, the possibility of attack, and the necessity of home defense. 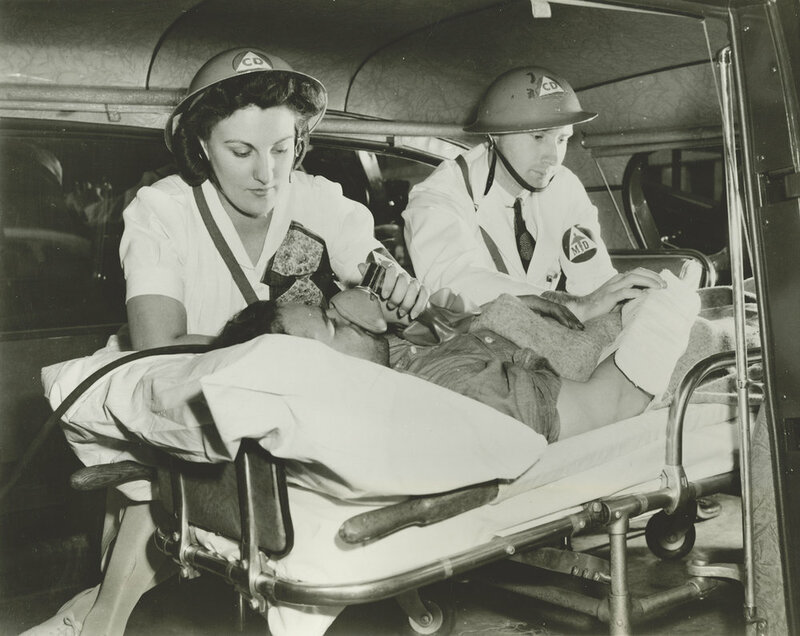 Two members of an Emergency Field Unit Squad in an ambulance treating a "victim" during a practice drill, January 1942. Mayor La Guardia Papers, NYC Municipal Archives. 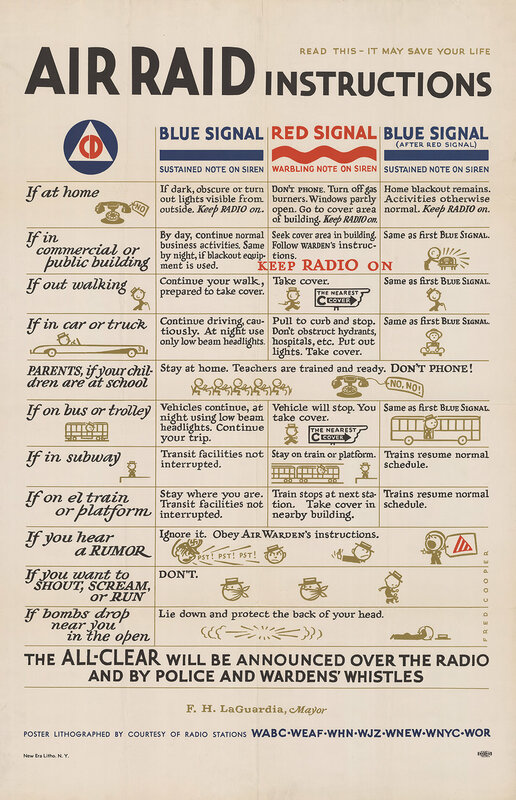 Air Raid Instructions, New Era Litho. Mayor La Guardia Papers, New York City Municipal Archives. Citizens Defense Corps staff helmet. Mayor La Guardia Papers, New York City Municipal Archives. 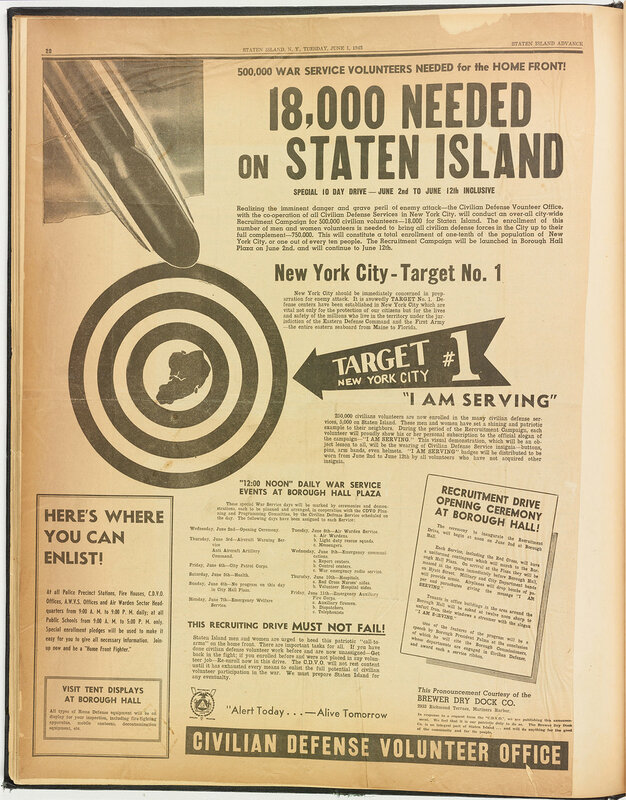 Advertisement from the Staten Island Advance, June 1, 1943. Mayor La Guardia Papers, NYC Municipal Archives. LaGuardia’s unlikely assistant director was none other than First Lady Eleanor Roosevelt, who had been instrumental in the creation of the Office. Initially wary of taking an active role in running the OCD, Roosevelt joined LaGuardia shortly before the attack on Pearl Harbor. The pair struggled to find common goals for the Office. Roosevelt saw the OCD as an opportunity to boost morale and promote social engagement. It was her opinion that “progressive social legislation” was a vital part of national defense. She argued that the best defense against fascism in the United States was to demonstrate the benefits and strength of democracy. Civilian Defense Recruitment Drive, Queens Borough Hall, 1943. Mayor La Guardia Papers, NYC Municipal Archives. “Prepare for Anything” A photo spread from the Sunday before the Volunteer Drive kick off. Journal-American, May 30, 1943. Mayor La Guardia Papers, NYC Municipal Archives. 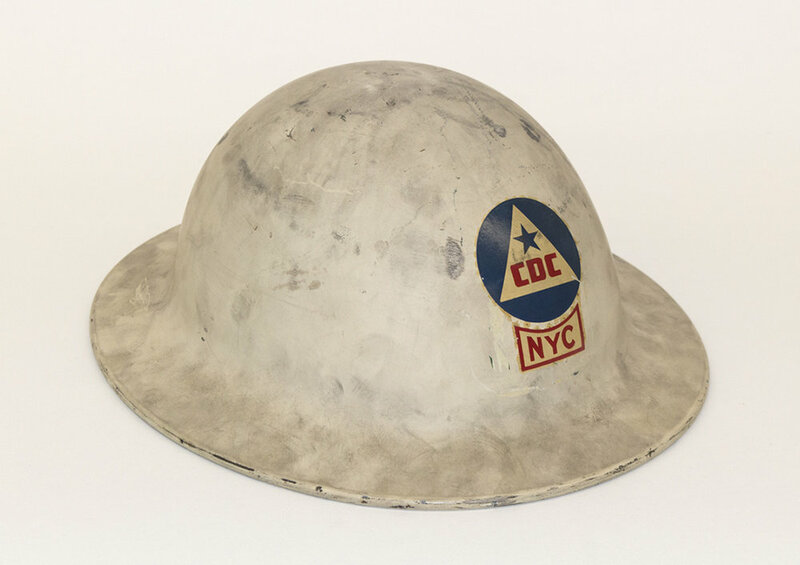 The Municipal Archives holds a rich collection of material documenting La Guardia’s tenure at the Office of Civilian Defense. The scrapbook seen here is visually rich, and captures the June 1943 volunteer drive that drew 20,000 people to its opening ceremonies. 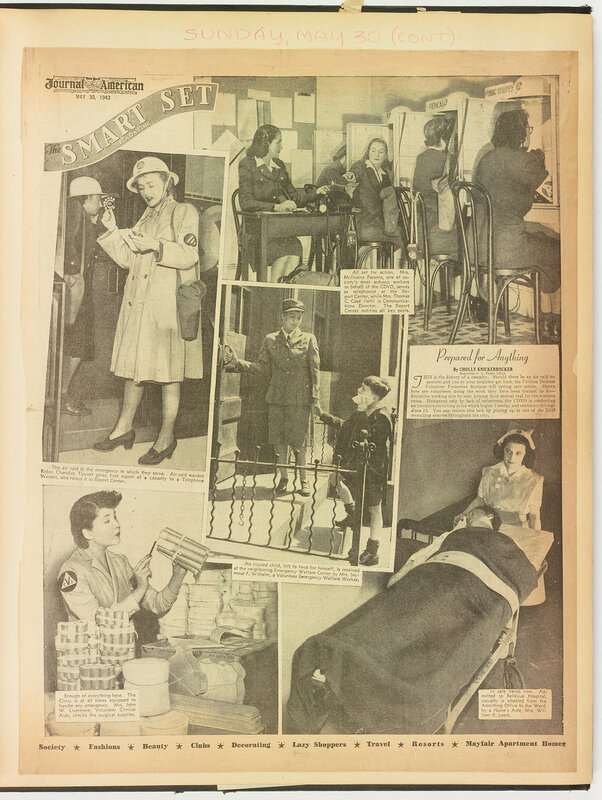 Military personnel marched with auxiliary units like the Navy’s WAVES (Women Accepted for Volunteer Emergency Service), or the WAAC (Women’s Auxiliary Army Corps), and those organized by the OCD, like air raid wardens and fire spotters. It was designed to be a show of enthusiasm and unity, but also to prove that home defense units could be as organized and well trained as the military. The material in the La Guardia Mayoral Papers include correspondence, memos and administrative documentation that show La Guardia’s efforts to organize the air raid wardens, the auxiliary fire fighters, the fire spotters and medical staff serving with the OCD, as well as all the educational efforts to help people prepare their homes and design air raid plans. They are microfilmed and available to the public. 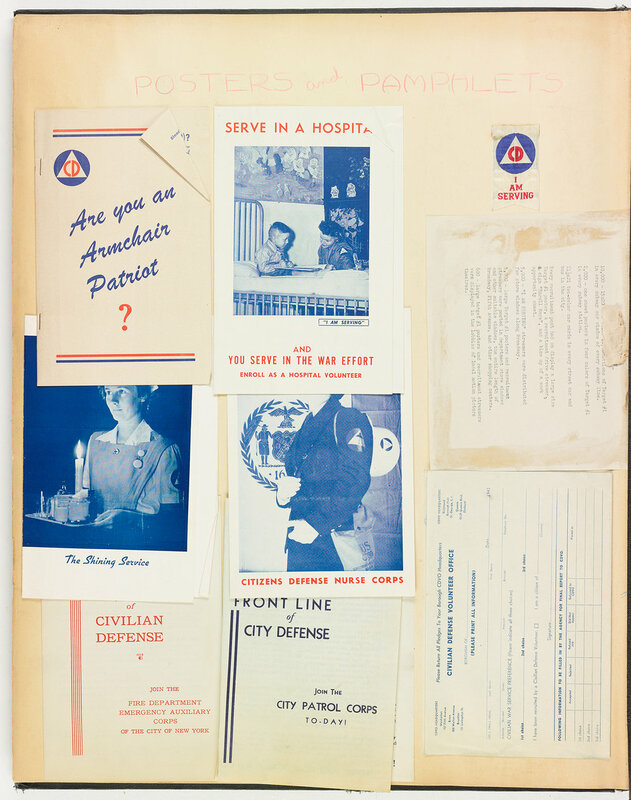 Pamphlets collected in the Civil Defense scrapbook. Mayor La Guardia Papers, NYC Municipal Archives. Other Mayoral Collections contain records generated by later incarnations of the OCD. The Office of Civilian Defense was abolished in 1945, but similar duties were given to the Office of Civil and Defense Mobilization in 1958 which was created in response to the Cold War. This office then became the Office of Civil Defense in 1961. In 1972, it became the Defense Civil Preparedness Agency before being abolished in 1979. The agency’s duties were given to the Federal Emergency Management Agency (FEMA). Material related to the OCD and its successor agencies can be found in the subject files of Mayors O’Dwyer, Wagner, Impellitteri, Lindsay, and Beame. The Municipal Library also has publications issued by the OCD and its later incarnations. Dallek, Matthew. Defenseless Under the Night: The Roosevelt Years and the Origins of Homeland Security. Oxford University Press, 2016. Executive Order. No. 8757, 1941.